Hope everyone had a wonderful weekend! Ours was full with my husbands hockey fundraiser game on Friday, a group meeting Saturday am and stamp club in the evening. Sunday was church in the morning and then we had my parents over for a belated Easter dinner. Lots of fun! Today I want to share with you one of the things we did at my group meeting on Saturday. I did a very brief demonstration of My Digital Studio. This was just to give everyone a snapshot of what MDS can do. I had created the above page just using the 8-1/2x11 page option and then had it printed through SU! 's professional printer. It was made so that it could be cut down and used on a hybrid project. This is what the card looked like after we finished adding some embellishments to it. We mounted it onto a Not Quite Navy card base, wrapped a piece of vanilla taffeta ribbon around it and then added 3 Not Quite Navy brads and it was done. This was a super quick & easy card and took all of about 3 minutes. 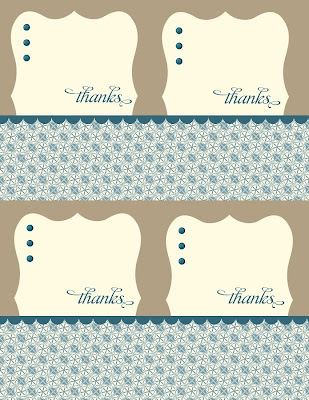 This is a fabulous idea if you need to make lots of invitations or thank you's. By making it into a hybrid project, it still gives it the feel of a hand made card. If you have any questions about MDS or anything else, feel free to email me, I'd be happy to answer them. Plus - did you know that the digital starter kit is still available?! This is a great option if MDS is something on your wish list and it's only $239! If you are interested in finding out more about this or our regular starter kit and are in the Edmonton, Sherwood Park or surrounding areas stop by my information night on April 19th to get all your questions answered.